A bit longer answer — the solution is great for sales reps, field workers, service staff, managers, repairmen, account managers, etc. — basically all people who aren’t sitting at their desk their entire working time. But employees in the office have not been forgotten! Resco CRM’s web interface allows them to work from a desktop or a laptop, while their mobile co-workers keep up with the latest information via their phones and tablets. Short answer — everyone who wants to work with CRM data on the go. What back-end systems does Resco Mobile CRM connect to? Resco Mobile CRM is a mobile client for Microsoft Dynamics 365, Salesforce, Oracle CX and can also serve as a standalone CRM solution. It provides direct connection to these systems, which means you can set it up in a couple of minutes. What devices/platforms does the app support? Any device running on one of these operating systems will work. How do I synchronize the application? Open the Resco Mobile CRM application and tap the ‘Sync’ button in the upper right corner. Fill in your login credentials and synchronize the application by tapping the Sync button once again. You can refer to the Resco Mobile CRM Synchronization Guide for detailed instructions on how to connect the app to your CRM system. My application cannot sync with the server, why? Make sure the login information you have entered is correct. Look for possible mistakes in the URL, name or password, as those are a very common cause of synchronization fails. You can also contact your system administrator or go over the Synchronization Guide to see if you’re filling in login credentials correctly. If these steps didn’t resolve the issue, go to the Resco Mobile CRM application’s About section and use the upper right button to send us the log – we will contact you with a solution or request for more information. Why are my Accounts/Contacts/Leads not shown on the map? To display records on the map, you’ll need their GPS coordinates: latitude and longitude. 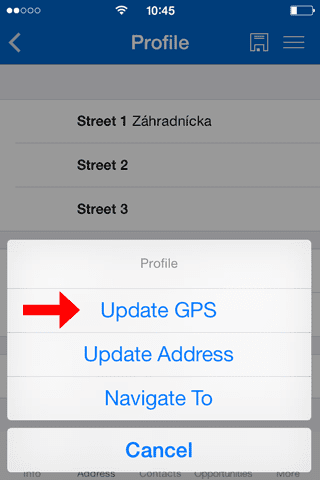 You can either fill these in manually, save them by using the ‘Update GPS’ functionality once you arrive to your destination, or use the geocoding functionality we provide to translate addresses into GPS coordinates in a bulk. Please note; you’ll need to have fields that contain words latitude and longitude in their names enabled for an entity. They should be a real number type of fields. In an online mode, you are working with the real-time data on your server. During the course of this time, you need to have Internet connection and access to your server available. In an offline mode, you are working with data that was stored in the local database of your device. So you can work also without a connection to server/Internet. You’ll need the connection only to synchronize the local database with the server. For a technical deep dive into online vs. offline mode, read this detailed description. Why isn’t all of my data in the application? By default, the application uses Synchronization filters for offline mode to download only the most recent and relevant data. Using the configuration console, system admins can re-define or remove these filters. If you have more than 10,000 records (which is the default setup of most filters) in an entity, and you want them to be downloaded to the application, go to the Mobile CRM application’s Setup and increase the “Max sync records” number. What happens if my smartphone/tablet gets stolen or lost? If your device is lost or stolen and you want to protect the data stored on it, system administrators can lock the application remotely or wipe out the data from it. Note: System admins can also create conditions that will automatically wipe out or lock the application (e.g. after 3 invalid password entries). If you don’t have the professional version of the app, hence cannot use remote wipe/lock, you can disable the “Save password” option to prevent potential misuse of data (you’ll need to enter the password each time you launch the Mobile CRM app). The locally stored database is always encrypted and safely protected from potential misuse. Why cannot I create/edit/delete a record? The record you are trying to edit is either deactivated (happens for example after a lead has been already qualified or an opportunity has been closed as won or lost), or you are missing the privilege in your security role, or it was configured this way by the system admin. Please check with your system admin which one of these causes this limitation. How secure is my data when it’s on a mobile device? Your data is, by default, encrypted by the highest encryption standards. For more information on the data encryption and security as a whole, check the detailed Security Document. How often do you update the solution? The major updates with new features are being released quarterly. Between the major updates, we release minor updates with minor features or fixes. How can I purchase the professional version? You can either purchase it from your CRM provider, from our website, or you can contact us for a quote. Can I customize the application? Absolutely! Resco Mobile CRM is a fully customizable mobile client – you can select what types of records you want to see, change its functionality, add fields you want to work with, implement custom business logic, or alter the look of the application. Start your free trial to see what is possible or get in touch with us to start the discussion. Can I add custom entities and fields into the application? Yes, you can easily enable custom entities and fields get in touch with us & find out how. Can I create different versions of the app for different users? Yes, you can create different versions of the mobile application for different types of users. The application will download the correct app configuration after a user synchronizes the application – for instance, a sales rep will get a different setup of the application from what a service technician uses. I have workflows set on the server; can they be in the app as well? I cannot see a record in the offline mode, but I can see it in the online mode. There are two possible reasons for this behavior: Either a synchronization filter, that limits the number of records that are downloaded to Mobile CRM app’s offline database, does not include the record you’re looking for. Ask your system administrator to modify these filters if you need to have the record available offline. Or, the second reason can be that there is a set limit for the number of records per entity – this option can be changed in Mobile CRM app’s Setup section. The option is called ‘Max Sync Records’. As a user, you can increase the number of records for an entity from the default 10,000 records to a larger number. This change requires a Data Delete (also an option in Setup), which deletes all the records from the offline database. Warning: Be careful when performing this data delete, all unsynchronized changes will be lost. Therefore synchronize the app before the delete to prevent loss of any data. As an administrator, you can increase the number of records that is downloaded per entity in the configuration console by changing the ‘Max Sync Records’ option. We recommend limiting data using Synchronization filters available for each entity, rather than using Max Sync Records, as the data restriction can show different results at each synchronization. What versions of Dynamics CRM does the solution support? Resco Mobile CRM supports Dynamics CRM 4.0, 2011, 2013, 2015, 2016 and all the latest versions of Dynamics 365. Both, online & on premise versions are supported. That’s all 16 of them. If that’s not enough, you can always add an additional language. Woodford is a configuration and administration tool that allows to configure the Resco Mobile CRM application for Microsoft Dynamics 365, Salesforce, Oracle, and more. And it is also a pretty good bourbon label. Where can I download Woodford? Here. You can choose whether to install Woodford on the currently used PC, or to download a solution file that can be imported to the CRM server and run Woodford from the CRM settings. For more information about the installation, please check Woodford manual. How much does Woodford cost? Woodford does not cost anything. It is simply a tool that enables you to use the purchased professional licenses of Resco Mobile CRM. Also, the 30-day trial of Woodford, as one would expect, is free of charge. Can I try Woodford before purchasing a license? Yes, you can try the 30-day free trial of Woodford for unlimited amount of users. Once you publish the first customization (mobile project), the trial starts automatically. What are the limitations of the trial version of Woodford? Woodford’s functionality is the same, no matter if you are in the trial period or you have purchased Mobile CRM license(s). The only difference is that there is no limit on the number of users in the trial mode. Once you purchase license(s), you will notice a new section in Woodford: Mobile Users. This is where you can assign licenses to users, or enable/disable users whenever you want to. Where are Woodford customizations stored? On first run, Woodford creates the required entities that start with ‘resco_’ on the Microsoft Dynamics CRM server. All the projects and other specific data are stored in these custom entities. Woodford does not start or suddenly cannot connect to the server. Please try to delete the Silverlight’s application storage. Right-click on Woodford’s window, select Silverlight, go to Application Storage tab and delete all the values that start with ‘resco_’ or with the URL of your server. Then click on OK and restart Woodford. First, make sure you’ve published the project (click on the ‘Publish All’ option when you are done with the changes). If that does not fix the issue, go into the Mobile project’s properties (can be found on the main screen in Woodford, upper left corner) and check if a security role is assigned to the project. Then you can use the option ‘Show Users’ to verify which users are enabled to use this project. If you change/assign the security role, re-publish the mobile project using ‘Publish All’ button. If you are a CRM user, please contact your CRM administrator (or person responsible for Resco Mobile CRM integration). If you are a CRM admin and you get a validation error when publishing a mobile project, you need to fix the errors before publishing. Otherwise users can experience this application crash. If you do not see any validation errors, but are still experiencing the application crash (or do not know how to fix these errors), please contact us at mobilecrm@resco.net with the log from Mobile CRM application’s About section. This error means the user (user’s security role) is missing the permission for the Entity (at least the read permission is needed). If the permission is not present or cannot be granted, you need to remove the Entity from the mobile project. Either your user name/password is not filled in correctly, or the time and date on your device is not set accurately. Please double check your credentials and use the ‘set automatically’ option for the date and time. Then try to synchronize the app again. To verify your credentials, try connecting to your CRM server from your mobile web browser. Please make sure that you use a correct CRM URL. You can try to connect to the same URL via a web browser on your mobile device to check if your CRM server is accessible. Your version of mobile app (e.g. 8.1.50) is older than the version of mobile project which is published (e.g. 8.3+). You should update the Resco Mobile CRM application on your mobile device (if the option is available to you). Otherwise ask your CRM administrator to re-publish the mobile project (customization) by selecting a compatible version in the configuration console. The problem lies within the currently set ‘Max Sync Records’. Only 10,000 records from each entity are downloaded by default. You can increase the number of records downloaded per entity in Mobile CRM app’s Setup or in the configuration console. If you don’t want to increase the Max Sync Records number, you can set the number of downloaded records by using Sync filters on entities.